An author who has a keen interest for the ‘off-beat’, he has covered and explored multiple facets of the marketing, advertising & technology sphere in his career. Lured towards the ‘cool’ technologies, he is an HTC snob, Hollywood movie buff and philosopher who likes to observe the world through his ‘Red Spectacles’. YouTube has become one of the top hot selling media properties in today’s time. From Q&As to tutorials to DIYs, YouTube has everything for everybody. In the technological sphere, there are tons of channels that host videos pertaining to gadgets and its use; be it reviews, tips or tricks as well as news. Here, we have listed 10 YouTube channels from India that are making technology easy for the masses. We have listed them on the basis of their popularity. However, we do have rated them on the basis of our review. Based out of Dubai, Gaurav Chaudhary, the host of Technical Guruji claims that the rational behind creating the channel was to make easy to understand tech videos in Hindi for the masses of India. Chaudhary claims that he wants each and every individual whoever is interested in technology to be able to understand it in the easiest possible way. Topics Covered: The YouTube channel posts videos daily that pertain to gadget reviews, technology news, tips and tutorials about devices and covers a wide rage of gadgets starting from mobile phones, to smart watches, to televisions, ISPs and even crypto currencies. The most simplistic Youtube channel, who breaks down technology for the layman and often is seen debunking myths and rumors going around about various technological things going around the net. Production value is average, but then he is not popular because of that. He’s popular for his ability to connect with the masses, which he does by giving examples and analogies from real life. In our rating, we have deducted another half a point simply for his going overboard at times and playing the game of hyping things, and building up suspense, very much like the Indian Hindi TV news channel guys. Youtube, as a media platform requires things to be quick and to the point, as there is a cost to bandwidth. Ranjit Kumar, the host of YouTube channel Geekyranjit claims to have been working with computers for over 25 years. Based out of Hyderabad, India, Kumar also runs a gadget review website called Tech2Buzz.com, and he quit his job as an IT consultant to start his YouTube channel. Topics covered: Though the channel Geekyranjit is in English, Kumar also hosts another page in Hindi language – Geekyranjit in Hindi, which had 49,931 subscribers at the time of writing this story. His channel features gadget reviews, and ‘expert’ opinion on tech spanning from unboxing to tips and tutorials about mobile phones, WiFi routers, chipsets, cameras among other devices. Geekyranjit as the channel name suggests will appeal more to people who have somewhat knowledge about technology. The language barrier too may not get Ranjit as much subscribers as Gaurav of Technical Guruji gets. Even though, he has a Hindi channel, but that will take some time to catch up; and yes, his Hindi is improving by the day. Despite the fact that Ranjit started his channel way back in 2011, Technical Guruji, which started only in October 2015, has manged to overthrow his supremacy. Production value is simplistic; no fancy stuff. Only straight talk. The Chennai based Ash, explains that he had worked for various BPOs and bought a Samsung Galaxy Note, tried to explain the specifications to his peers and all he got was whether they could play ‘Angry Birds’ on the same. This, became his inspiration for starting his YouTube channel. Topics Covered: Revolving around smartphones and Android only — reviews, comparisons and gadget tests to applications and game recommendations to mods, tutorials and Giveaways, C4ETech hosted by Ashish a.k.a Ash, claimed to be one of the most followed channel back in 2014. Shooting about 20-30 videos a month, Ash has also narrated the rationale behind the name C4ETech; he states that due to various ups and downs in his life he thought he was ‘Cursed 4 Eva’ and started doing what he loved to, i.e. technology reviews. Ash knows his stuff. But again English restricts his appeal. What also goes against him is the fact that a majority of his videos are mobile centric. Before launching iGyaan, Nagpal was a Disk Jockey with the alias DJ Krimp. According to wiki, he trained at Ministry of Sound London and also has a private house music album named Krimpnation to his name. He’s also invested in a company that is experimenting with holographic technology. Topics covered: The YouTube channel is the vlog version of tech-blog — igyaan.com — that offers reviews on cameras, mobile phones, Tablets, Headphones, games as well as tech-happenings in India. iGyaan started in 2010 and is claimed to be an influence to an influx of online blogging and YouTube video Production. iGyaan rates high on its production value. Most of his videos have been shot in 4K resolution. As a host, Bharat doesn’t hide behind a desk or keeps himself static. Is often seen outdoors and doesn’t shy from exploring new ideas, e.g. Nike Air Force One shoes or Snapchat spectacles, LED bulbs, besides others. He is often seen outdoors as well. Over the period, he has stopped showing himself less and focuses more on the gadgets. We have deducted one point for the language. Hope, he can do shows in Hindi, which will get him mass appeal. Bhatnagar, is a Professional Blogger and an Independent Web Consultant. Prior to his YouTube venture, he used to be a software engineer and has worked for various IT companies. Bhatnagar quit his job to open a technology media publication called Technixmedia which has several blogs, websites and web services. Topics Covered: Gadgets To Use provides news and reviews of latest technology and devices in India. It claims that every review that is posted on YouTube undergoes a series of benchmark tests that has been designed by the Gadgets to Use team. Besides reviewing gadgets, Abhishek has covered launch events as well. Simplistic and to the point. HAs been on Youtube since 2011. Despite the fact that the channel is in Hindi, he falls short of making a direct connect with the audience. As an engineer Sharma spent his life before becoming a YouTube personality in the IT sector. He’s held positions as a technical engineer at Ericsson and as an Application Specialist at ABB ISDC. According to a report in News18, Sharma was trolled on Reddit last year because he forgot to clear his search history (which was NSFW) while reviewing a Samsung Galaxy J Max 7. Topics covered: Sharmaji Technical was a tech vlog started by Praval Sharma sometime in May 2015. Sharma wanted to provide tech reviews in Hindi language and reach out to the masses who wanted to learn and understand technology in Hindi. Apart from Technical Guruji, hosted by Gaurav Chaudhary, Sharmaji Technical is one of the tech-vloggers who also has an Android app that features written as well as video reviews of different gadgets. Sharmaji has been on Youtube since 2008. He is an old hat, and newer channels have surpassed him by far numbers in terms of subscribers. We think, Praval, being a veteran deserves better. He can increase his production value; and probably move more outside the studio like iGyaan, and may be show himself less. The Founder and host of the channel, Khurana, is also the editor for its online textual counterpart which goes by the same name. Apart from spending about 4 years in the telecom software industry, Khurana has been authoring computer troubleshooting blog – Trouble Fixers since 2007. He is also the founder of the automobile blog and YouTube channel Car Blog India. Topics covered: Intellect Digest, hosted by Rohit Khurana provides updates on technology, gadgets, smart phones, tablets, computing, mobile computing and communication devices as well as the latest happenings and launches in the technology sphere of India. Intellect Digest states to put up its content everyday from Monday to Friday with some special sessions on weekends, which do not have a fixed frequency. On Youtube since 2012, Intellect Digest has a lot more potential. Besides covering mobiles and mobile centric gadgets, Rohit could pick up newer topics like IoT and smart homes too. Considering that his channel is in English, his audience may connect with fresher topics quickly. Production value is decent. Beebom was conceptualized by Kapil Jindal and Devinder Maheshwari to become a content website that would collate and produce technology resources written by ‘geeks’ from around the world. After facing a rough patch in their business plan, the duo thought of hiring more tech-professionals, who are now a part of the core team. Topics Covered: The YouTube channel is unique in its own way as it does not have a single host. 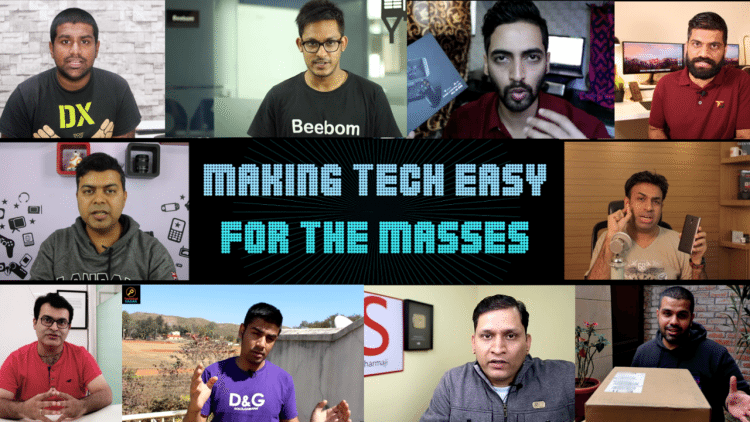 Together Devinder Maheshwari, Kapil Jindal, Rupesh Sinha, Akshay Gangwar and Pratik Tyagi host various video sessions related to tech and gadget reviews, DIY tricks and tips as well as technology resources. The folks at Beebom are late entrants on the scene, who joined Youtube in February, last year. They’ve moved up pretty fast. They don’t shy from going beyond mobile phones and have covered topics like Augmented Reality, Google Home vs Amazon Echo, DSLR cameras, Gmail tricks, Chrome tricks, besides others. restricting to English may not get them very high subscribers, but then that allows them to reach out to non-Hindi speaking states too. Amrelia, 28, states that his goal is to provide simple tips ad tutorials for tech-beginners on how to use their latest device and competent users to get untapped knowledge about a gadget. Topics covered: Apart from the generic technology reviews and news, the channel also posts tips and tricks for gadgets that the ‘common-man has not tried before’. Ruhez needs to slow down a bit, just a bit, while speaking. Has a pleasing personality. Can get more subscribers, if he can find analogies from real life and cover more topics outside mobile. Sagar, claims to be a self taught white hat hacker and a commerce graduate from India. With Internet and Ethical Hacking being his passion. Topics Covered: Sagar’s channel posts videos about cybersecurity, computer processors, tech news and happenings, tech and internet myths as well as reviews of mobile phones and video games. Sagar gets some extra points from us for the fact that he is one of the few who hasn’t shied from going beyond mobile. He simplifies topics like hacking, XML, DNS, Benchmarking, Botnet, Noise Cancellation, Web Spiders, 3D printing, and that too in a layman’s language, which is Hindi here. He periodically does videos under the “Mysterious Nights” title, where he has covered topics like vampires, spirits and reincarnation. However, he loses on production value. Apart from these individual 10 Indian tech video-bloggers, there are a host of other tech YouTube channels of Indian origin. Gadgets 360 by NDTV group, 91 mobiles by the ecommerce website 91 mobiles, Tech Guru Awaaz by CNBC Awaaz are a few, which have a huge subscriber base. Talking about the 10 that we have listed; though most have reviews of other devices, the majority is only focused on smartphones. Maybe because there is no dearth of brands in the market today and each brand has a large portfolio of mobile phones. This would probably be the reason behind daily content by these tech-YouTubers. However, considering that their channels have cross a couple of million views and subscribers combined, there seems to be a huge audience that is really interested in nothing but smartphones.